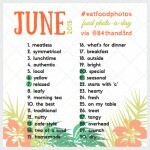 June Photo Challenge 2013 #junefoodphotos: The Food Photo-A-Day! 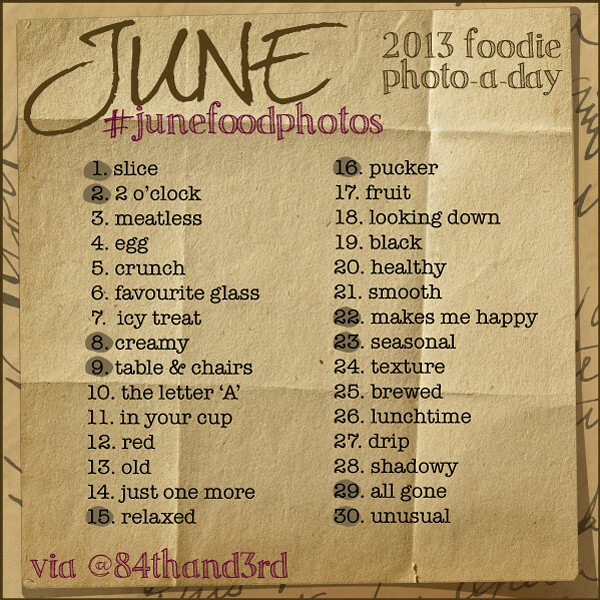 Without any further ado I present to you the list for #junefoodphotos, the June Photo a Day Challenge for Foodies! I’ll be playing along on Instagram, Twitter and Tumblr, and sometimes Vine too – pop by and say hello. 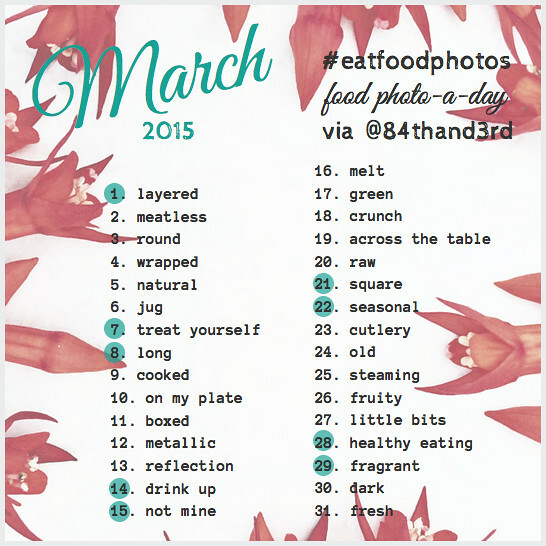 Take a food inspired photo each day of June that corresponds to the date and prompt in the list above. Feel free to interpret the prompts any way you’d like! Once your photo is taken, use the hashtag #JuneFoodPhotos to post and share wherever you’d like including Instagram, Facebook, Twitter, Flickr, Pinterest, Tumblr, Eyeem, G+, Vine or your blog. That’s it! Anyone is welcome to join, if you have any questions let me know and please share with others – the more the merrier. 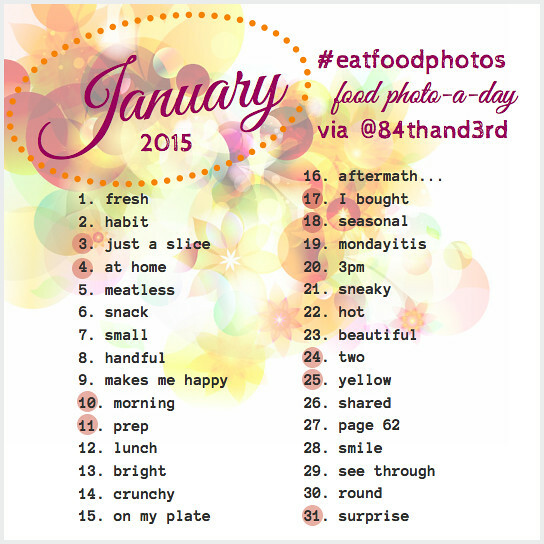 As always I must give a nod to Fat Mum Slim for her #fmsphotoaday challenge and Purple Carrot KC for starting foodie photo-a-day. 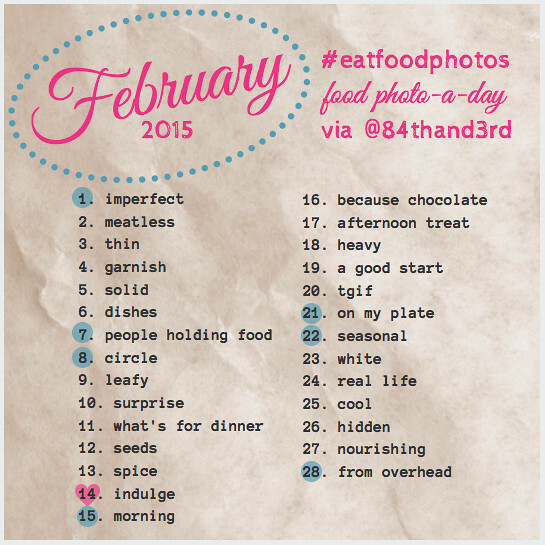 New to Foodie-Photo-a-Day? You can see all the past challenges here. I failed miserably for May so I’ll see if I can do better in June! Aww Nic, there is no fail, there is only try… (yeah, try to keep a straight face while typing that one ;D) Happy to have you join in any time you can! Can anyone tell me what pucker & shadowy mean? English is not my first language, I appreciate any help. Thank you. The 22nd is ‘makes me happy’ picture day. Very appropriate, it’s my birthday!